I actually did these nails quite some time ago (when I was a semi-newbie at nail stuff) which would explain the lack of clean up so please excuse that. I used all Love & Beauty polishes for this design except for the black polish which came from a black nail art pen. Love & Beauty doesn't actually give their nail polish names - well, you can see names on the Forever21 site but these came in a set - so I'll just name them myself. 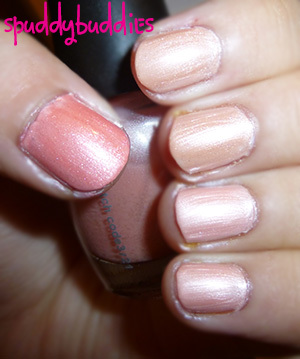 On my thumb is a Frosty Peach polish and the other polish on my other nails is a shade of Pearly Oyster. Both are very sheer and would probably require 4 or 5 coats (!!) to reach any kind of opacity so I layered them over white. In the picture above, I'm wearing one coat of both polishes and you can tell that it's streaky. Now here I'm wearing 2 coats of both polishes. The pearly finish has obvious brushstrokes but I don't mind that so much. At first, I used Love & Beauty - Pale Blue, Pale Pink and Pale Orchid to do some random stripes. Suddenly the color didn't seem so bad and I found myself reaching for my nail art pen to fill in the blanks with dots and arrows. I took the pictures before I put on top coat so if you're wondering whether I was going for a textured look, I wasn't. This might not be one of my best nail designs but it was spontaneous and I ended up figuring out a way to jazz up the poor base colors. So if you have a nail color that you don't like on you, you could probably try something like this. I LOVE all things tribal print. Do you? You could start out with some simple lines and dots. That's what I did but I started to get more and more obsessed with filling the blank spaces haha! I'd love to see your spin on tribal nails. I am still trying to perfect straight lines using a nail art brush so here's to us succeeding in doing awesome tribal nails!